Are you searching for a vehicle repair shop that offers affordable and reliable auto repair in Powell, OH? Depend on Wayne's Auto Repair to keep your motor running! Our experienced ASE-certified technicians address car problems quickly and prevent more costly repairs down the road. Because we are skilled at car and truck repair, we know how to accurately fix your broken vehicle without breaking your budget. 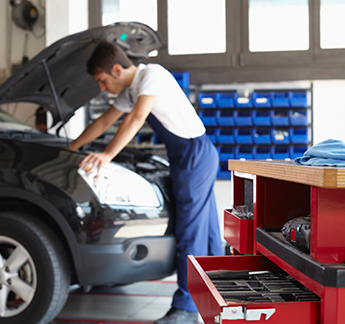 Save money by coming to our auto repair shop for comprehensive car repair services. There are many moving parts in your truck or car. If something breaks, do you know how to fix the problem? You may be able to change a tire or even replace a battery, but performing brake changes or engine work is beyond your skillset. Don't get your hands dirty or try to fix the problem on your own. Instead, depend on our experienced mechanics. How is your truck holding up? We keep you trucking down the road when you need truck repair. From basic oil changes to complex engine repair jobs, we provide a wide range of services for truck owners. Our shop is the place to come for affordable and accurate truck repair services. There's no need to take your vehicle anywhere else. Because our auto technicians are skilled and ASE-certified, they address all vehicle problems and concerns. Why Choose Our Auto Repair Service? Why take a chance by going to an auto garage that is unknown? Not only are we a reputable business with an experienced team, but we are also properly credentialed - both our company and our auto technicians. That way, we ensure you receive only the best auto repair service at the best rates. We are dedicated to serving our valued customers and ensuring their complete satisfaction. In addition, we invite you to join our Loyalty Rewards Program where you can save even more money on repairs. Contact us to schedule a comprehensive auto diagnostic for your car or truck. We proudly serve customers in Powell, Lewis Center, Delaware, and Dublin, Ohio.